OPC took place in an area of northern Iraq above the 36th parallel. This area, approximately 160 by 70 kilometres (99 by 43 mi) in size, was designated a "no-fly" security zone by UN coalition forces, enforced by a combined task force (CTF) of daily armed aircraft patrols from participating nations, including the United Kingdom, France, Turkey, and the United States. The United States Army was tasked with assisting civilian relief agencies to build communities and facilities for the Kurds in Northern Iraq. Over the next three years, 27,000 fixed-wing and 1,400 helicopter coalition flights took place in the zone to support humanitarian operations without interference from Iraqi aircraft or other military units. On 14 April 1994, at 07:36 local time, a USAF E-3 AWACS aircraft from the 963d Airborne Air Control Squadron (based at Tinker Air Force Base, Oklahoma) departed Incirlik Air Base (AB), Turkey in support of OPC. 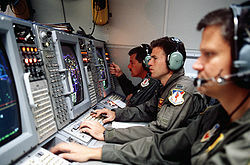 The AWACS, with its 19-member crew under the mission crew command of Major Lawrence Tracy, was to provide airborne threat warning and air control for all OPC aircraft during its time aloft. The AWACS crew reported on station at its assigned surveillance orbit altitude of 32,000 feet (9,750 m) located inside Turkey just north of the northern border of Iraq at 08:45. The weather that day was fair and clear over northern Iraq. At 08:22, two U.S. Army UH-60 Black Hawk helicopters from the 6th Battalion, 159th Aviation Regiment (based in Giebelstadt, Germany), called Eagle Flight, departed Diyarbakır, near Pirinçlik Air Base, Turkey headed for the OPC military coordination center (MCC) located 150 miles (240 km) away in Zakhu, Iraq. Both helicopters were fitted with external, 230-US-gallon (870 L) fuel tanks on sponsons mounted beside each side door with each tank emblazoned with large American flags. In addition to the flags on the fuel tanks, each helicopter was marked with American flags on each side door, on the nose, and on the belly. The lead Black Hawk was piloted by U.S. Army Captain Patrick McKenna, commander of the Eagle Flight detachment of six helicopters. At the MCC, the Black Hawks picked up 16 members of the UN Provide Comfort coalition leadership team including four Kurdish civilians, one Chaldean-Catholic civilian, three Turkish, two British, and one French military officers, plus five U.S. civilian and military officials. At 09:54, the helicopters departed the MCC for Erbil, Iraq, a distance of 120 miles (190 km). The Black Hawks reported their departure, flight route, and destinations by radio which was acknowledged by Halcli. Halcli then re-initiated the friendly helicopter track on his scope. Two of the Black Hawk passengers were Colonel Jerry Thompson, U.S. Army, commander of the MCC, and his replacement, Colonel Richard Mulhern, U.S. Army. At Arbil and later at Salah ad Din, Iraq, Thompson planned to introduce Mulhern to two prominent Kurdish leaders, Masoud Barzani and Jalal Talabani, as well as to UN representatives. Halcli placed tags on his radar screen to show the two Black Hawks' track and notified Wang of the helicopters' movement. In addition to Halcli's screen, the friendly helicopter symbols were visible on the radar screens of Wang, Tracy, and USAF Major Doug Martin. 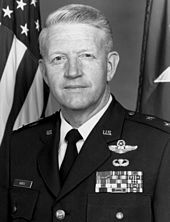 Martin was the "Duke" or "ACE" airborne command element on the AWACS, meaning that he was a rated aircrew member assigned to the crew to ensure that all engagement (combat) mandates were adhered to and executed as written in OPC policies. Meanwhile, at 09:35, two USAF F-15C fighter aircraft from the 53d Fighter Squadron, piloted by Captain Eric Wickson and Lieutenant Colonel Randy W. May, departed Incirlik AB. Their mission was to perform an initial fighter sweep of the TAOR to clear the area of any hostile aircraft prior to the entry of coalition forces. The air tasking order (ATO) that was supposed to list all scheduled coalition aircraft missions for that day and which the two pilots reviewed before takeoff, mentioned that U.S. Army Black Hawk helicopters would be operating in the TAOR that day but did not list takeoff times, routes, or flight durations for them. At 10:15, Wickson radioed Martin on the AWACS and asked if he had any information to pass to them to which Martin replied in the negative. At 10:20, Wickson, the F-15C flight lead, reported entering northern Iraq to the AWACS controller responsible for air traffic inside the TAOR, USAF Lieutenant Ricky Wilson. The TAOR frequency that the F-15s were using was different from the en-route frequency being used by the two Black Hawks. Wilson, however, was monitoring both frequencies and being able to see both Black Hawks on his radar scope before they disappeared at 10:12. Wilson and the other AWACS crew members, many of whom were monitoring the F-15s' radio frequency, did not inform the F-15s that Black Hawks were currently operating in the TAOR. At 10:21, Wilson, believing that the Black Hawks had landed again, asked Wang if he could drop the friendly helicopter symbols from the AWACS's scopes and Wang approved the request. An AWACS crew instructor, Captain Mark Cathy, who was on the mission to assist the AWACS crew and supervise Wilson on this, his first mission into the TAOR, had retired to the back of the airplane at 10:00 to take a nap. The two F-15s now initiated a visual identification (VID) pass of the contact. The VID pass entailed violating one of OPC's rules of engagement, which prohibited fighter aircraft from operating below 10,000 feet (3,050 m) above the ground. At this time the two Black Hawks had entered a deep valley and were cruising at a speed of 130 knots (150 mph; 240 km/h) about 200 feet (60 m) above the ground. Wickson's VID pass was conducted at a speed of about 450 knots (520 mph; 830 km/h), 500 feet (150 m) above and 1,000 feet (300 m) to the left of the helicopters. At 10:28 Wickson reported "Tally 2 Hinds" and then passed the two Black Hawks. "Hind" is the NATO designation for the Mil Mi-24 helicopter, a helicopter that the Iraqi and Syrian militaries operated and was usually configured with armament on small, side-mounted wings. Wilson responded with "Copy, Hinds" and asked Wang, "Sir, are you listening to this?" Wang responded, "Affirmative" but offered no further guidance or comments. May then conducted his own VID pass about 1,500 feet (500 m) above the helicopters and reported, "Tally 2." May later stated to a USAF accident investigation board that his "Tally 2" call meant that he saw two helicopters but did not mean that he was confirming Wickson's identification of them as Hinds. Neither F-15 pilot had been informed that U.S. Army Black Hawks participating in OPC often carried auxiliary fuel tanks mounted on wings nor had either been instructed in the paint scheme that Iraqi Hind helicopters used, light brown and desert tan, which was different from the dark green color used by the Black Hawks. Wickson later stated that, "I had no doubt when I looked at him that he was a Hind... . The Black Hawk did not even cross my mind." Following their VID passes, Wickson and May circled back behind the helicopters approximately 10 miles (16 km). Because aircraft from various nations sometimes operated unannounced in the northern Iraq area, the OPC rules of engagement required the F-15 pilots to attempt to verify the nationality of the helicopters. Instead, at 10:28, Wickson notified the AWACS that he and May were "engaged" and instructed May to "arm hot." At 10:30, Wickson fired an AIM-120 AMRAAM missile at the trail helicopter from a range of about 4 nautical miles (10 km). The missile hit and destroyed the trailing helicopter seven seconds later (36°46′N 44°05′E﻿ / ﻿36.767°N 44.083°E﻿ / 36.767; 44.083). In response, the lead Black Hawk, piloted by McKenna, immediately turned left and dived for lower altitude in an apparent attempt to evade the unexpected attack. About 20 seconds later, May fired an AIM-9 Sidewinder missile at the lead helicopter from a range of about 1.5 nautical miles (2.8 km), hitting and shooting it down also about 1.2 miles (2 km) northeast of the trail helicopter (36°55′N 43°30′E﻿ / ﻿36.917°N 43.500°E﻿ / 36.917; 43.500). 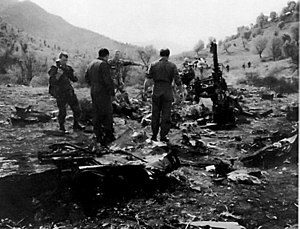 All 26 people on board the two Black Hawks were killed. After flying over the wreckage of the two helicopters lying burning on the ground, May radioed Wickson, "Stick a fork in them, they're done." On 26 August 1994, the U.S. Department of Defense announced that it would pay U.S.$100,000 (ex gratia) in compensation to the families of each of the non-U.S. personnel killed in the incident. At this time, the U.S. government did not offer compensation to the families of the U.S. victims, citing the Feres precedent, which prevents lawsuits against the U.S. from injured service members or families of personnel killed due to military negligence. This was the first time that the U.S. had offered compensation to the victims of a friendly fire incident. In 1998, Congressman Lamar S. Smith, chairman of the Subcommittee on Immigration and Claims, held hearings on the compensation issue. He questioned the DoD representatives as to why compensation had not also been offered to the U.S. family members. In November 1999 the U.S. Congress passed legislation authorizing payment of compensation to the families of the American Black Hawk victims. Wickson resigned and May retired from the USAF soon after Fogleman's investigation was completed. 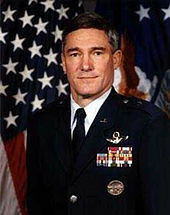 Lawrence Tracy retired immediately after Wang's court-martial on an early (15-year) retirement option. By May 2005, Jim Wang was still serving in the USAF, but he remained at the rank of captain, having been denied promotion. Interviewed in 2005 about the shootdown, Tracy stated, "Jim (Wang) and all of us at first were held up as scapegoats. I think that was to cover up for the pilots. They had their fangs out. They wanted to kill something because it had been ages since an F-15 had shot anything down. We were held accountable for their actions." ^ Piper, Chain of Events, p. 6–22, 42, 51, 157, Weiner, "Court-Martial Nears in Case of Helicopters Shot Down", Snook, Friendly Fire, p. 4, 55, & 100, Hall, Michael, My Son, p. 105. Martin was a rated navigator with 2,000 flying hours, mainly in General Dynamics F-111 aircraft and had flown in the 1986 Bombing of Libya. The lead helicopter's crew and passengers included: Patrick McKenna (27), pilot, John Garrett (32), co-pilot, Jeffrey Colbert (22), crewman, Mark Ellner (21), crewman, Jerald Thompson (48), MCC commander, Richard Mulhern (43), new MCC commander, Paul Barclay (24), US Army special forces soldier, Barbara Schell (50), US State Department advisor, Harry Shapland, British military officer, Hikmet Alp, Turkish military officer, Salid Said, Kurdish representative, Barlas Gultepe, Turkish military officer, Bader Mikho, Kurdish representative, and Ahmad Mohammad, Kurdish representative (Hall, pp. 97–103). The trail helicopter's crew and passengers included: Michael Hall (28), pilot, Erik Mounsey (28), co-pilot, Cornelius Bass (22), crewman, Michael Robinson (23), crewman, Laura Piper (25), US Air Force officer, Benjamin Hodge (32), US Army intelligence specialist, Ricky Robinson (33), medic, Jonathan Swann, British military officer, Guy Demetz, French military officer, Ceyhun Civas, Turkish military officer, Abdulsatar Arab, Kurdish representative, Ghandi Hussein, Kurdish representative (Hall, pp. 93–97). ^ Washington, "So, Who's to Blame? ", Piper, Chain of Events, p. 25, Snook, Friendly Fire, p. 58–59, 83–86, & 101. Randy May was the squadron commander of the 53rd with over 3,000 flying hours and had shot down an Iraqi Hind helicopter in northern Iraq near Kirkuk during the Gulf War. Wickson had over 1,300 flying hours with about 700 in F-15s and this was his 18th mission over OPC. ^ The USAF AFR 110-14 Accident Investigation Report Summary states that Tracy was not currently qualified because he had not flown the requisite three sorties during the prior three months. On 22 December 1993 Tracy was placed in "Duty-not-involving-flying" (DNIF) status and did not fly again until 23 February 1994 when he flew one sortie and was waivered to return to mission ready (MR) status. He did not fly another sortie until the 14 April 1994 mission in which the Black Hawks were shot down. During that time period, Tracy was incorrectly left in MR status and subsequently incorrectly designated as mission crew commander on 14 April. ^ Novak, "Past Fiasco dims General's new Third Star", reported in "Soldiers for Truth" and in Diehl, Silent Knights, p. 252, Piper, Chain of Events, p. 119. ^ Verhovek, "Air Force Officer Is Acquitted in Downing of Army Aircraft", Piper, Chain of Events, p. 220–221. ^ Bacon, "DoD Press Briefing", Verhovek, "Air Force Officer Is Acquitted in Downing of Army Aircraft", Piper, Chain of Events, p. 221. ^ Arana-Barradas, "Black hawk incident "tragic series of errors". ^ Verhovek, "Air Force Officer Is Acquitted in Downing of Army Aircraft", Diehl, Silent Knights, p. 251, Piper, Chain of Events, p. 224. ^ Washington, "So, Who's to Blame? ", Schmitt, "Chief of Air Force Grounds 5 Pilots", Piper, Chain of Events, p. 224, 231–232, Diehl, Silent Knights, p. 251. ^ Piper, Chain of Events, p. 70–71, 233–236, Hall, Michael, My Son, pp. 205–206. Others testifying at the hearing included Major General Stephan Silvasy, Jr., U.S. Army, for the Joint Chiefs of Staff, USAF Major General Nolan Sklute, USAF Judge Advocate General, US Navy Rear Admiral James Lair, Director of Operations for the US Navy in Europe, US Army Captain Michael Nye, an Eagle Flight pilot, retired USAF colonel Jerry Cox, a former USAF pilot and journalist for the Military Times, and Frank J. Spinner, Wang's attorney (Hall). ^ Schmitt, "Chief of Air Force Grounds 5 Pilots", GAO, "Operation Provide Comfort"
^ Piper, Chain of Events, p. 239–240. ^ Arana-Barradas, "Black hawk incident 'tragic series of errors'", GAO, "Operation Provide Comfort", Schmitt, "Chief of Air Force Grounds 5 Pilots", Piper, Chain of Events, p. 240, Sklute, "DoD NewsBriefing". ^ Piper, Chain of Events, p. 243, 247–250, Diehl, Silent Knights, p. 251. ^ Diehl, Silent Knights, p. 252, Piper, Chain of Events, p. 250–251, Novak, "Past Fiasco dims General's new Third Star"
^ Piper, Chain of Events, p. 253–254. ^ Diehl, Silent Knights, p. 252, Piper, Chain of Events, p. 254–256. ^ CBS News, "'A Great Deal of Arrogance'", Piper, Chain of Events, p. 262–263, Novak, "Past Fiasco dims General's new Third Star"
^ GAO report, Diehl, Silent Knights, p. 251, Piper, Chain of Events, p. 241–242, Snook, Friendly Fire, p. 65. ^ GAO, "Operation Provide Comfort", Diehl, Silent Knights, p. 252–253, Snook, Friendly Fire, p. 65, Hall, Michael, My Son, pp. 274–282. ^ GAO, p. 32–33, discussed in Snook, Friendly Fire, p. 96. ^ GAO, p. 32–33, discussed in Snook, Friendly Fire, p. 96, Diehl, Silent Knights, p. 252–253, Hall, Michael, My Son, pp. 274–282. ^ Snook, "Friendly Fire", p. 96. ^ Diehl, Silent Knights, p. 252–253, Piper, Chain of Events, p. 251, 262, GAO, "Operation Provide Comfort", Hall, Michael, My Son, pp. 274–282. ^ Diehl, Silent Knights, p. 51 & 245, Piper, Chain of Events, p. 145–150; Hall, Michael, My Son, p. 162. The US Government also paid $100 in compensation to Kurdish farmer Mohammed Amin Khorshid for damage to his onion field caused by the crash of one of the two helicopters (Hall, p. 162). ^ Piper, Chain of Events, p. 264 & 269, Diehl, Silent Knights, p. 326. ^ Washington, "So, Who's to Blame? ", GAO, "Operation Provide Comfort"
^ Piper, Chain of Events, p. 258. ^ Chu Lin, "Friendly Fire Doesn't Shoot Down Wang", Piper, Chain of Events, p. 196, Hall, Michael, My Son, p. 276. Hall states that May retired at the lower rank of major. Hall says that he asked repeatedly for Wickson to contact him to discuss the shootdown but that Wickson never responded (Hall, p. 304). ^ Piper, Chain of Events, p. 216. ^ Chu Lin, Friendly Fire Doesn't Shoot Down Wang. Hall states that after his court martial, Wang called the victims' family members and apologized. ^ Chu Lin, "Friendly Fire Doesn't Shoot Down Wang". ^ Novak, "Past Fiasco dims General's new Third Star", USAF, Official biographies of Andrus, Croker, Dallager, Emery, Pilkington, Richardson, and Santarelli. ^ Hall, Michael, My Son, pp. 212, 226. Four hundred people attended that dedication ceremony at Giebelstadt. A videoteleconference room at the Air Force Intelligence, Surveillance and Reconnaissance Agency at Kelly Field Annex was named in honor of Cornelius Bass on 26 March 1998 (Hall, p. 293). ^ Davies, Steve, and Dildy, Doug, F-15 Eagle Engaged—The World's Most Successful Jet Fighter, Osprey Publishing, Botley, Oxford, UK, 2007, ISBN 978-1-84603-169-4, page 211. Diehl, Alan E. (2003). Silent Knights: Blowing the Whistle on Military Accidents and Their Cover-Ups. Potomac Books. ISBN 978-1-57488-544-6. Hall, Allen L. (2002). Michael, My Son, and the Story of the Eagle Flight Detachment. New York: Vantage Press. ISBN 978-0-533-13789-3. 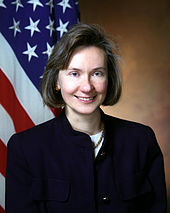 Piper, Joan L. (2001). Chain of Events: The Government Cover-up of the Black Hawk Incident and the Friendly-fire Death of Lt. Laura Piper. Brassey's. ISBN 978-1-57488-344-2. Snook, Scott A. (2000). Friendly Fire: The Accidental Shootdown of U.S. Black Hawks over Northern Iraq. Princeton University Press. Arana-Barradas, Louis A. (1996). "Black hawk incident "tragic series of errors"". Retrieved 16 February 2007. Bacon, Kenneth H. (1995). "DoD News Briefing: Mr. Kenneth H. Bacon, ATSD PA". DefenseLink. Retrieved 1 March 2007. CBS News (27 February 2001). "'A Great Deal of Arrogance'". CBS News. Retrieved 16 November 2007. Chu Lin, Sam (2005). "Friendly Fire Doesn't Shoot Down Wang". AsianWeek.com. Archived from the original on 17 January 2013. Retrieved 16 February 2007. "Eagle Flight Detachment Memorial Monument Friends". 1994–2007. Retrieved 16 February 2007. General Accounting Office (GAO) (1998). "Operation Provide Comfort: Review of U.S. Air Force Investigation of Black Hawk Fratricide Incident". Archived from the original on 2 March 2007. Retrieved 1 March 2007. Moran, Michael (2005). "Battling friendly fire: Military pins hopes on new technologies as fratricide proves a stubborn foe". MSNBC.com. Retrieved 1 January 2008. Novak, Robert (2000). "Article 3: Past Fiasco dims General's new Third Star". Soldiers for the Truth. Retrieved 1 March 2007. Peterson, Iver (3 June 1995). "Court-Martial Begins in 'Friendly Fire' Deaths in Iraq" (Newspaper article). The New York Times. Retrieved 20 December 2007. Schmitt, Eric (1 July 1994). "Copter Deaths: Pentagon Finds Human Failure" (Newspaper article). The New York Times. Retrieved 20 December 2007. Schmitt, Eric (15 August 1995). "Chief of Air Force Grounds 5 Pilots" (Newspaper article). The New York Times. Retrieved 20 December 2007. Sklute, Nolan (1995). "DoD NewsBriefing: Major General Nolan Sklute, AF/ SJA". DefenseLink. Archived from the original on 30 December 2006. Retrieved 1 March 2007. United States Air Force (1995). "Major General James G. Andrus". Air Force Link. Archived from the original on 19 March 2007. Retrieved 16 February 2007. United States Air Force (1996). "Lieutenant General Stephen B. Croker". Air Force Link. Archived from the original on 19 March 2007. Retrieved 16 February 2007. United States Air Force (2003). 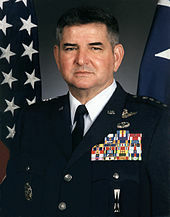 "Lieutenant General John R. Dallager". Air Force Link. Archived from the original on 19 March 2007. Retrieved 16 February 2007. United States Air Force (1997). "Brigadier General Curtis H. Emery". Air Force Link. Archived from the original on 19 March 2007. Retrieved 16 February 2007. United States Air Force (1996). "Brigadier General Jeffrey S. Pilkington". Air Force Link. Archived from the original on 19 March 2007. Retrieved 16 February 2007. United States Air Force (2000). "Brigadier General Douglas J. "Doug" Richardson". Air Force Link. Archived from the original on 19 March 2007. Retrieved 16 February 2007. United States Air Force (1998). 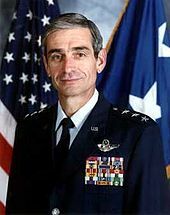 "Lieutenant General Eugene D. Santarelli". Air Force Link. Archived from the original on 19 March 2007. Retrieved 16 February 2007. Verhovek, Sam Howe (21 June 1995). "Air Force Officer Is Acquitted in Downing of Army Aircraft" (Newspaper article). The New York Times. Retrieved 20 December 2007. Washington, Mark Thomas (3 July 1995). "So, Who's to Blame?". Time. Retrieved 1 March 2007. Weiner, Tim (15 April 1995). "Court-Martial Nears in Case of Helicopters Shot Down" (Newspaper article). The New York Times. Retrieved 20 December 2007. Arlington National Cemetery (2000–2006). "Cornelius A. Bass, Specialist Five, United States Army". Retrieved 1 March 2007. Arlington National Cemetery (2000–2006). "Jerald Lee Thompson: Colonel, United States Army". Retrieved 1 March 2007. General Accounting Office (November 2007). "Operation Provide Comfort: Review of U.S. Air Force Investigation of Black Hawk Fratricide Incident" (PDF). Archived (PDF) from the original on 29 February 2008. Retrieved 22 January 2008. Kern, Tony T. (1999). Darker Shades of Blue: The Rogue Pilot. McGraw-Hill Professional Publishing. ISBN 978-0-07-034927-8. Ladkin, Peter B.; Stuphorn, Jörn (2004). "Two Causal Analyses of the Black Hawk Shootdown during Operation Provide Comfort". Proc. Eighth Australian Workshop on Safety Critical Systems and Software (SCS 2003), Canberra, Australia. CRPIT, Vol. 33.